Amsterdam has a number of local ferry services on the IJ river which connect the city centre to Amsterdam Noord (North). The ferries are run by the municipal transport company GVB. A number of ferries operate from the northern side of Amsterdam Central station and can get you to the likes of Eye Film and NDSM wharf. Line numbers of the GVB ferries are 900-915. 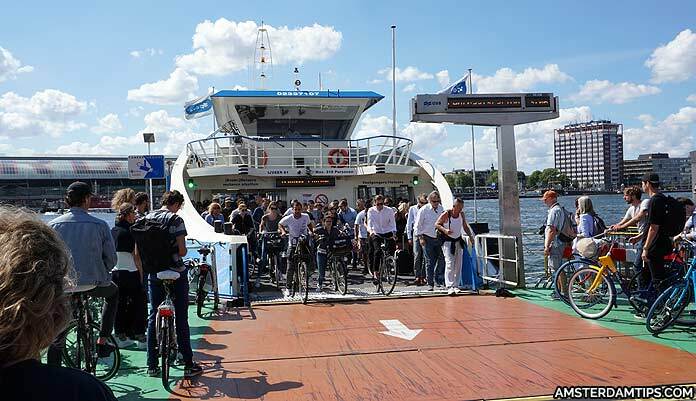 To reach the main GVB ferry terminal head to the northern IJ-side (IJzijde) exit of Amsterdam Central either via the station or the eastern foot/cycle tunnel. Do I need a ticket for the Amsterdam ferry? No, the ferries are FREE and take foot passengers (just hop on board) as well as cyclists and moped users. Note, that smoking is prohibited on all Amsterdam ferries. 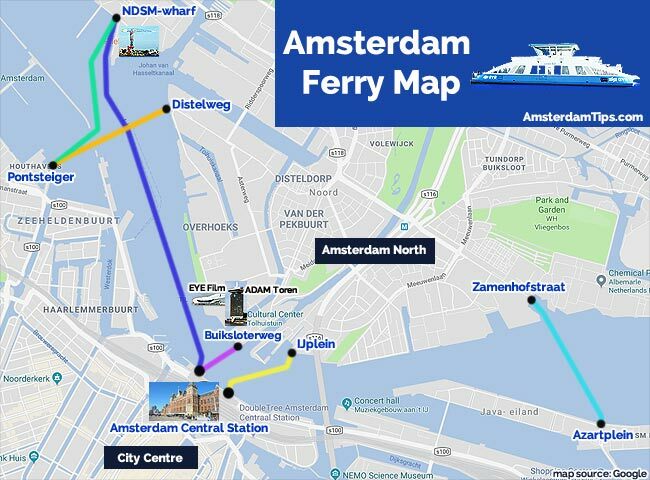 There is a night ferry service (905) loop running Central Station-NDSM wharf-Pontsteiger-Central Station. It operates weekdays (0000-0200) and weekends (0000 and 0300). These free ferries provide a good opportunity to get out on the water and see Amsterdam from another perspective. Take the Buiksloterweg ferry to get to the striking EYE Film, a film exhibition space and the adjacent A’DAM Lookout tower. A trip to NDSM wharf is also recommended – an old shipyard wasteland area being regenerated into offices and art exhibition/festival space. GVB also operates other ferry services across various points of the Nordzeekanaal (North Sea canal) such as Velsen Zuid-Velsen Nord – although these are of less interest to city visitors.